At our CPXi office in New Orleans, CPXi team members met the pet of their dreams, while volunteering at the Jefferson Parish Animal Shelter. Recently, there was a major flooding in Baton Rouge. To find new ways to help out after the massive destruction, our team found a local article about displaced animals in Baton Rouge. After the devastation, the shelters in New Orleans quickly became overcrowded with rescued animals. Some animals had to be moved to the Jackson Mississippi State Penitentiary and the Jefferson Parish Animal Shelter. Unfortunately, in the process of the State moving these animals to the Jefferson Parish Animal Shelter, they brought/carried an aggressive case of ringworm with them. For the volunteer workers, it was heartbreaking to see puppies and kittens in quarantine covered in ringworm. 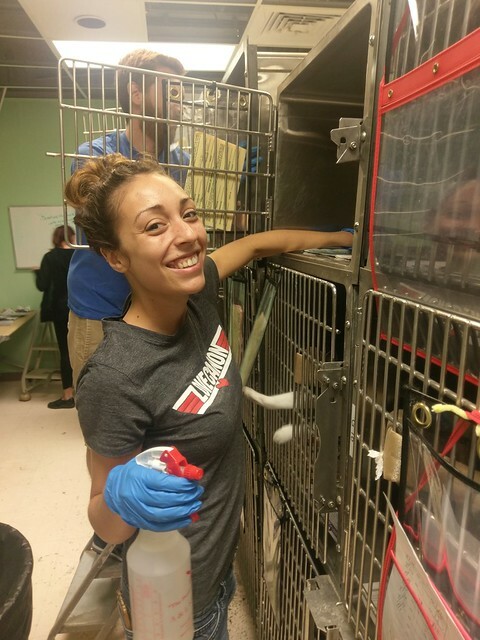 The CPXi volunteers got to work, put on their gloves and rolled DOWN their sleeves to diligently clean these animals in Hydrogen Peroxide baths. Other CPXi volunteers (those with cat allergies) spent time walking dogs, cleaning dog mess, bleaching the dogs feeding bowls, washing and folding laundry. The state of Louisiana had an abundance of overly generous donations. The items that were donated ranged from blankets, pillows, and towels to Monsters Inc. beds, Minions costumes, and even sequined prom dresses. Some of our CPXi volunteers assisted with this overwhelming yet rewarding sorting process. In addition to that, 3,000 files of adoption charts that had never been ordered chronologically, were organized by CPXi volunteers. At CPXi, one of the core values is our commitment to creating a caring community and the NOLA CPXi volunteers came together to improve the lives of these displaced animals. They truly helped in the recovery effort, which made a huge difference in an animal’s life. Great job NOLA CPXi Volunteers!